MARTIN IMPROBABLY QUALIFIED FOR THIS WEEK’S MAJOR CHAMPIONSHIP. Casey Martin is highly unlikely to win the U.S. Open, which begins today at the Olympic Club in San Francisco. He’s not even likely to make the 36-hole cut, which would allow him to tee it up for this weekend’s for the tourney’s final two rounds. But the 40-year-old linksman is already a winner in my book. Because hardly anyone in the Open field has had to overcome the adversity Martin has faced. 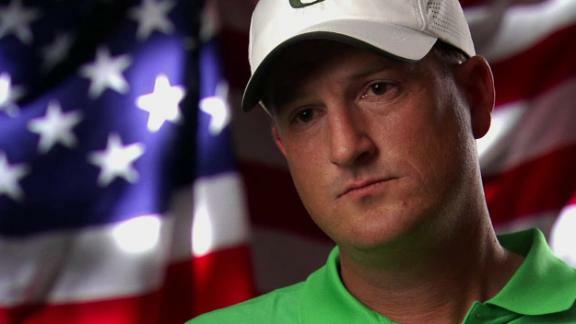 That’s because Martin, the men’s golf coach for the Oregon Ducks, suffers from a debilitating birth defect in his lower right leg, Klippel–Trénaunay–Weber Syndrome, which makes it difficult for him to walk. Martin acknowledges that his right leg “is pretty fragile” and sometimes “quite painful.” But day by day he limps along with equanimity; with an inner peace that surpasses all understanding. That’s a testament to Martin’s Christian faith. It enabled him to be a three-time all-Pac 10 golfer while at Stanford, even as he struggled with his disability. It enabled him to earn his PGA Tour card in 1999, and to prevail in a 2001 lawsuit against the Tour when it tried to ban him from use a golf cart during competition, despite his obvious disability. And it enabled him to shoot a pair of 69s last week in sectional qualifying for the Open, earning him his spot in this year’s championship. “For me to be here, is pretty surreal,” said Martin, between pre-tourney practice rounds at Olympic. Well, I, too, look forward to seeing what’s in store for the golfer today and tomorrow (and, hopefully, Saturday and Sunday). But no matter whether he makes the Open leaderboard at some point during the proceedings, or even makes the cut, Casey Martin has proven himself more than a conqueror. 14 Jun	This entry was published on June 14, 2012 at 7:44 AM. It’s filed under Sports and tagged CASEY MARTIN, CHRISTIAN, DISABILITY, GOLF, U.S. OPEN. Bookmark the permalink. Follow any comments here with the RSS feed for this post. No matter where he finishes, Casey sets the pace. What a testimony!